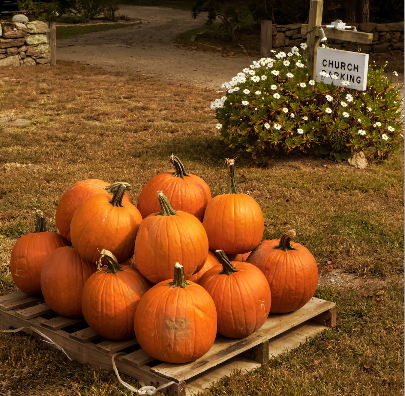 Begun by Christine Marzigliano in 2008, the Pumpkin Patch is a beautiful sight along Route 6A in Barnstable Village. Prices are reasonable and we have various sizes from tiny to huge. There are autumn goodies to purchase, as well. This year’s 6th Annual Pumpkin Sale was a winner in so many ways. We had beautiful weather, not a single pumpkin rotted, more than 30 volunteers joined the effort, we supported a responsible local farmer, and we brought hundreds of smiles to the faces of folks who just loved our really beautiful pumpkins. Some 550 pumpkins netted just over $2,300 for UCB. We were sold out in just 7 and a half days. But the real story of this event is always the people part! Our volunteers truly enjoy making this happen and our customers feel good about our church. What more could we ask for?